Do you miss The Lucksmiths? Have I got good news for you, Marty Donald, Mark Monnone, Louis Richter, and Noah Symons, have formed Last Leaves… and from what I’ve heard, it sounded just as good as the old Luckies songs. Sadly, singer/drummer Tali White is not in the band, but obviously with his involvement with The Guild League, it’s good to know that he’s still around. As you know, I’m a fan. I got a MiniDisc of their songs and loved it. I’ve seen the band at the 7th Street Entry on 18 June 2001 and 24 July 2003 and bought T-Shirts and CDs (still have them all). With their debut album Other Towns Than Ours, I’m hoping to see Last Leaves on tour to support the album. I know, for certain, that I’ll be there, if they play Minneapolis. Last Leaves’ debut album Other Towns Than Ours is available tomorrow (October 20th), via Matinée Records, which you can head over to the website to place your order: matineerecordings.com. One of my favorite love song is called "Smokers in Love" by the Lucksmiths. The song is the lead track on their EP Staring at the Sky (the title is taken from their song "The Golden Age Of Aviation", which appeared as the last track). The Lucksmiths have written some of the smartest and wittiest songs I've ever heard, and I'm sort of sad that they are no longer a band. I first 'discover' the band via a penpal who made me a Lucksmiths MiniDisc. That as in the late 90s, so I've been a fan of their music for quite a while. I own many of their singles, but picked up a ton more when I saw the band at 7th Street Entry on June 18, 2001. Normally I don't remember who open up for the band, but that night The Ladybug Transistor was the opener. As you can see from the setlist that I stole, they did all the hits for me at the time: "Music to Hold Hands To", "Untidy Towns", "Under the Rotunda", "T-Shirt Weather", "Tmrw vs Yday", and, of course, "Smokers in Love". I caught the Lucksmiths again at 7th Street Entry on 07/24/2003 when they toured for Naturaliste, which they did a ton of songs from that album ("Midweek Midmorning", "Camera Shy", etc). The encore, I believe was only one song: "Broken Bones", and "The Year of Driving Langourously" (per fan's request). Anyway, I still love The Lucksmiths, especially in the Summer, when I go bicycling and just put on their music on my headphones and spend the day with them. If you like what you've heard, you can purchase some Lucksmiths music over at lostandlonesome.com.au. You spent Thursday on your backside, whistling "Friday On My Mind"
Update: Fans who are just discovering the Luckies, good news for you, there is a 'greatest hits' double disc compilation called Cartography For Beginners out now. Track listing were compiled by the band members and organized by year. But I'm biding time until the cassingle revival. Here's a known secret: if you need your music released on cassette, Burger Records is the place to be. Even major label Universal Music Enterprises is turning to Burger cassette needs... to help celebrate/pay tribute to Lou Reed and Velvet Underground's 45th Anniversary of White Light/White Heat, an album that Reed famously said "No one listened to it. But there it is, forever – the quintessence of articulated punk. And no one goes near it." In traditional Burger style, White Light/White Heat Tribute Album will be available ON CASSETTE ONLY. Don't have a cassette player? No problem, starting December 2nd and continuing to October 9th fans will be able to download a song a day for from the tribute album exclusively on SPIN.com. A special three-disc White Light/White Heat 45th Anniversary Super Deluxe Edition will be available December 10th from Universal Music Enterprises (UMe). I've already own their Deluxe Edition of The Velvet Underground and Nico and I have to say that Ume packaging is the best. They typically include a stereo and mono mix, which, if you're a purist, would appreciate the latter mix. Nashville's Natural Child are back with a brand new album called Dancin' With Wolves. The album is coming out February 25th, 2014 on Burger Records, but you can catch their preview single, "Saturday Night Blues", on Spin.com. Er, naturally, Natural Child will be heading out on tour in support of Dancin' With Wolves, with another animal band, Futurebirds. Pat Thomas is described as "the tall dude" who plays bass in Cool Ghouls. Seems like this cool ghoul just released a solo album called Coasters Riding in the Air on December 3rd via Empty Cellar. The cassette-only release is available now from Burger Records. The reason for this collection of songs by Thomas is that he's actually written more songs for Cool Ghouls than they can release. Since he only accounts for one fourth of the band, as far as contributing music material, it only made sense for him to release it under Coasters Riding in the Air. FILTER described the album as "filled with touches of psychadelic fuzz and an alt-country twang." Israeli shoegaze band Vaadat Charigim's debut album The World Is Well Lost is out now on Burger Records (cassette), Warm Ratio (vinyl), and Israeli label ANOVA (CD/digital). The Tel Aviv trio (Juval Haring on guitar/vocals, Yuval Guttman on drums and Dan Fabian Bloch on bass), plays a blend of 80s Israeli underground rock with a more European Post-Punk sound. Although the band only sing in Hebrew, they are developing a strong international following. Representing The Lucksmiths, a band that needs no introduction, is bassist Mark Monnone, from the Summer-er-ness of Melbourne, Australia (while I'm buried in a blizzard in Minneapolis). You would think that since I am a longtime Luckies fan and having over 200 of their songs (and knowing most of them by heart), it would be easy. It's not. Add on top of that, 0% preparation time... well a disaster, I tell you. Also, the audio for this interview is terrible, and it's all my fault. When I couldn't hear Mark's vocals, I had set his audio to maximum and forgot to reset it back - so as a result the audio is extra loud. I tried to fix it as best I could by applying some filters, but I think the audio could be better. So super apology to Mark and the Lucksmiths. PS, just to let you know what a dork I am when it comes to this band, if you type in "successlessness" dot vox dot com into your address bar, guess where it takes you? I eventually had to change the name to "we heart music" as no one in the world can spell that 's' word. The story behind "Young and Dumb" and "Requiem For The Punters Club"
Mark's been listening to The Harpoons and The Crayon Fields. Both bands come highly recommended, so I'll be sure to add them to my to-do list for 2009. Be sure to catch them on December 20th at the free instore at Pure Pop Records in Melbourne! I would be totally there if I wasn't stuck here. Amy Campbell is an acoustic folksy singer/songwriter from Toronto, Canada. She came on W♥M Radio to talk about her music. You can buy Oh Heart, Oh Highway directly from her website. It isn't so pricey if you consider it's two discs with a book of art and writing from Amy Campbell. Plus it's in knowing the money goes directly to the musician, not some corporation, so it's all good. As the world is now quite aware, the longest race for Presidency came to its conclusion last night. I'm relieved now that it's over, and I hope Barack Obama will do something about the economy (it seems that the economy only really became a concern towards the end). 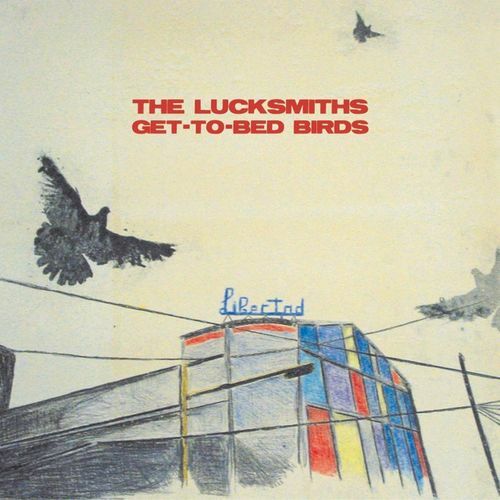 I was looking to reuse Drugstore's "El Presidente", but the subject matter of a President assassination didn't sit well with me, so instead I am offering one of my favorite song of all time: "To Absent Votes" by The Lucksmiths. There is just something about this song that I absolutely love. It's the mellow melody, it's the way singer/drummer Tali White paints the picture of a town, post election day. Wow, right? Some of the best lyrics ever. This particular song was written by bassist Marty Donald, who's also cranked out some other hits for me: "A Hiccup In Your Happiness", "The Chapter In Your Life Entitled San Francisco", "Shine On Me", "Frisbee", and many more. You know, come to think of it, all Lucksmiths songs are hits for me. They are just too witty for their own good. Anyroad, their brand new album, First Frost was just released by Lost and Lonesome in Australia, and as poor as I am, I don't think I can afford an import copy (please see comment below). Thanks for the info. I checked out Matinee's website. They're offering First Frost for $10. I'm not sure what year it was exactly, but I'd say it was about 5-6 years ago. At the time my favourite internet hang out was the old Jeepster Belle & Sebastian chat room. I frequented that room with not only hopes of making friends with similar musical interests, but I also hoped to maybe find some geek-tastic Scottish lad to whisk me away from the States. Well, there never was any whisking away by a Scotsman (though there was a certain guy from West Virginia of all places that managed to capture me briefly), but something else more profound happened to me. One day while waiting for the aforementioned West Virginian, an Aussie boy happened into the chat and struck up a conversation with me about his favourite band, the Lucksmiths. I told him that I'd never heard of them before, but he assured me that if I liked Belle & Sebastian, then I was sure to dig the Lucksmiths as well. Immediately after our chat I went to the Candle Records website to listen for the first time to the band that was soon to become my absolute favourite. The one mp3 Candle had up at the time was for 'Under the Rotunda'. From my initial listen, I was hooked. I must have listened to that song about 50 times that night and with each additional listen, I loved it a bit more. I couldn't believe that music like this existed and was disappointed that I was just then discovering it. My newfound love of the Lucksmiths opened up a whole new world for me: the world of indie pop music. I'd heard the term "twee" before, mostly in reference to B&S, but prior to the Lucksmiths I don't believe I'd heard of indie pop. Indie pop. What a glorious term! I thought the Lucksmiths were a fluke, but I soon came to find out that there was an entire genre of music devoted to jangly guitars and 'ba-ba-bada-bas'. Do you have that one book or one movie that you turn to when you feel as though the world is closing in on you and you just need an escape? For me, the Luckies are my great escape. When I'm feeling my crummiest, they restore me to good spirits. The combination of Tali White's mellifluous voice and their guitar pop ushers up false feelings of nostalgia. All my dearest friends are spread out all over the world and I rarely get to see them, but the Lucksmiths are my constant companion, making me feel less alone whenever I listen to them. They might not be what I was looking for that day in the chat room, but they were exactly what I needed. This is an interesting cover by one of my favorite band, the Lucksmiths. They covered the Magnetic Fields song (and I have to admit I am more partial to the cover than the original). I'm not sure where else this song appeared in, but the only format I've got is from the T-Shirt Weather single (which is another favorite). Also, I'm finally breaking my streak of girl-music. The next couple of entries will be on manly men music.